I did it in the Peace Chapel (Franciscan church) in Sremski Karlovci, when the war in Croatia (still part of Yugoslavia) was on its peak. 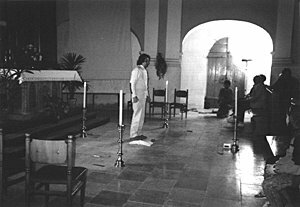 In order to invoke peace, in the place where a historical peace treaty was signed in 1699, I was breaking knifes aimed toward four cardinal points, and lighting candles on their places. In the audience there were Croats, who make a great part of the population there, Serbs and all other different nations gathered in this prayer for peace.